Keep your wedding party realistic. Four to six is a good number (3 men and 3 women) fits comfortably in our Church, allows you to focus better and have less to worry about. Try to find flat shoes or at least VERY comfortable shoes - especially for the women in your party. You will spend a great deal of time on your feet, and you will be able to enjoy the day better with happy feet. Remember that this is Michigan, and the weather will be a factor for you to consider. Anticipate cool and hot temperatures - in the same day. These conditions play huge factors for men on hot days and women on cool days. The wind will also be a factor for hair - both men and women. Just in case, give consideration to shawls or wraps for the women. Try to arrange all the details to be done the day before the wedding, so that on THE day, you can relax and take care of those little “crises” that seem to always arise. Less is more! Have all the men try on their tuxedos and all the other clothing that comes with them they day you receive them. Unfortunately, there are often wrong sizes of shirts, socks can be forgotten, and trips back to the tuxedo store are not usually part of your schedule. If using young children in your wedding party, look for those that are at least five years old. While younger children are so cute, they can “rain on your parade,” and leave you with less than happy memories. Plan the seating of parents, grandparents, and those who will be ushered in. Seven people are about the maximum number that can fit easily in a pew. Remember to leave room for a parent if there is a younger child in the wedding party. 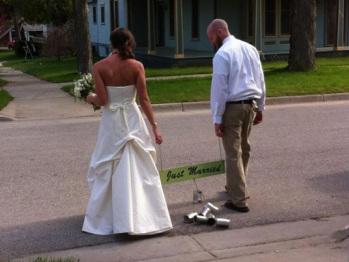 Think twice about using an aisle runner. They are not especially “safe,” and having someone trip and fall at your wedding is not a memory that you necessarily want to have. It is not necessary to purchase a boutonniere for the pastor.